On July 22, Ontario Superior Court Justice Carole Brown ruled in a landmark decision that lawsuits against the Canadian mining company Hudbay Minerals regarding shootings, murder, and rapes at its former mine in El Estor, Guatemala can proceed to trial in Canada. The plaintiffs in this case are indigenous Mayan Q’eqchi’—who allege that security personnel working for Hudbay’s wholly controlled subsidiaries (HMI Nickel Inc. and Compaňia Guatemalteca De Niquel) committed human rights abuses at their Fenix mining project. The cases come from incidents occurring in 2007 and 2009. They consist of the following: 11 Mayan women charging that they were gang raped by security personnel during the forced eviction of their village, that security forces murdered indigenous leader and anti-mining activist Adolfo Ich, and that security personnel shot and paralyzed another man. The incidents occurred over a struggle for the right to the land on which the Fenix site—a proposed open pit nickel mine—was located. The court ruling states that “The factual context from which these actions arise, as set forth in the pleadings, is as follows. Several indigenous Mayan Q’eqchi’ farming communities were located on a portion of the Fenix property. At all material times, the defendants maintained that they had a valid legal right to this land, while the Mayan communities claimed that the Mayan Q’eqchi’ were the rightful owners of the lands, which they considered to be their ancestral homeland. The plaintiffs allege in their pleadings that any claim to ownership by the defendants is illegitimate, as rights to those lands were first granted to the defendants by a dictatorial military government during the Guatemalan Civil War, and during the time when the Mayan Q’eqchi’ were being massacred and driven off their lands.” In addition to the human rights abuses cited in the lawsuits, security forces were also involved in the burning of numerous homes and armed intimidation in order to clear residents from the mining site. The ruling strikes an important first blow against the unjust legal protections multinational corporations have worked so hard to set up in the global economy. Hudbay Minerals is arguing that they cannot be held legally responsible for the deadly and destructive actions of their subsidiaries in Guatemala because on paper they are separate legal entities—although that's not the case when it comes to making money. While the outcomes of the current lawsuits against Hudbay Minerals are far from clear—and there is a long way to go—it is a necessary step in the right direction. The victory against Hudbay Minerals sets an important precedent whereby Canadian mining companies can be held legally accountable in the future for committing human rights abuses and environmental degradation which occur at their foreign operations. For far too long the industry has acted with near impunity – it is about time that companies become accountable for the destruction and death that they market as much needed economic development across the Global South. 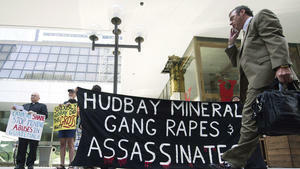 Whether or not the ruling will result in any change on how mining companies behave in the near future will be telling.